The Region of Trentino Alto Adige Italy has two names because it consists of two distinct parts. 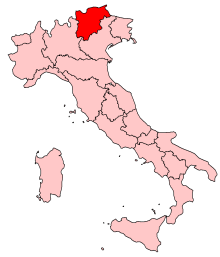 The southern part, the Trentino, named after its capital, Trento, which is the ancient Roman town of Tridentum. The northern part is called Alto Adige as it corresponds to the upper basin of Adige river, the second longest italian river. The German name of South Tyrol is Südtirol and been on the border with Austria and Switzerland, in this part of Italy the most spoken language is German. Located in the far north of Italy, on the border with Austria and Switzerland, Trentino Alto Adige, between the Italian regions is best known for the beauty of its mountains. From the mountains and glaciers are falling down abundant waters, that hundreds of thousands of years have plowed the land and dug the mountains to the point of turning this area into a maze of valleys. Driving through these valleys, at every turn of the road there is a different and unexpected view: ordered orchards and dark pine forests, gently sloping pastures and towering rugged cliffs that jut hundreds of feet, silent rivers that flow through the fields and wild torrents that deafening roar among the rocks. This scenery contains an extraordinary variety of landscapes, lofty mountains, forests, river valleys, rivers, lakes, the charming play of light between the spiers of the Dolomites, charming villages with bell towers and a thousand shades of an authentic and untouched nature. A huge ski area with hundreds of miles of trails puts the region at the forefront of winter tourism: Ortler Skiarena and Dolomiti Superski, Madonna di Campiglio, Moena, Canazei and San Martino di Castrozza are the most famous attractions, frequented both in winter and summer for a holiday immersed in nature, sport and entertainment.